NEW Arrivals #LatesCollection #SummerCollection #WomenFashion We are wholesalers & Supplier's unstitched cotton salwar suits, Hand Block Print Salwar Suits, Sarees. You can get Cotton Salwar Suits, sarees with us at wholesale price because we are manufacturers & exporters for designer cotton collections. We are the supplier, manufacturer, and exporter of wholesale womens clothing. We are based in Rajasthan but we feel proud to say that our products are famous all over the world besides India. We at Aarav Collection follow a certain business strategy where we take the help of the latest upcoming technologies along with our solid experience and expertise to meet the client’s expectation. This is the main reason of why our online wholesale women’s clothing business is flourishing with each passing days in this highly competitive business world, where other portals are struggling hard to take a breath. Now, don’t think much and give a blend of traditional and trendy touch to your wardrobe with wholesale womens clothing at Aarav Collection. Are You Searching For Cotton Sarees Wholesale Supplier? If you are a lover of cotton saree and are searching for elegant cotton sarees which are not only comfortable to wear but also trendy and pocket-friendly, then no other online shopping portal can be as good as Aarav Collection. It is one of the best shopping destinations one can ever have. We are one of the brand names in the market in the field of cotton sarees wholesale supplier and exporter. 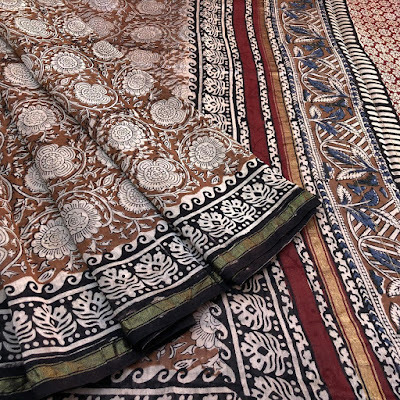 Our cotton sarees are unique in its design, pattern, style, and quality. They are the blend of Indian tradition and contemporary fashion. We use the finest quality of cotton to give you the maximum comfort when you wear it for any occasion starting from parties to office formals. Our exclusive collections consist of Bagru hand block printed cotton saree, designer trendy cotton saree, Bagru Discharge print cotton sarees, Sanganeri hand block printed sarees, and many more. If you try our exclusive ranges of cotton sarees, we are sure that you will be spoiled for choice, like many of our present customers in India as well as across the border. 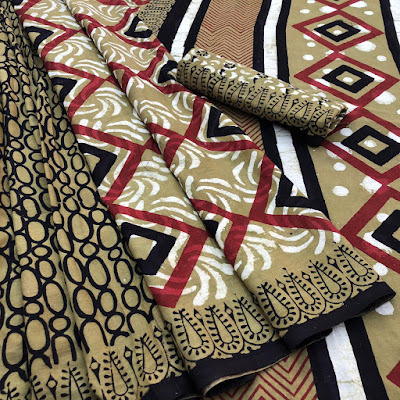 We at Aarav Collection work day and night to take care of your taste and elegance, that’s why we are the trusted manufacturer, exporter, and supplier of hand block printed cotton saree in national as well as the international markets since ages. The demands of these sarees are increasing in the market with each passing days because these skin-friendly cotton sarees are not only beautiful but also easy to wash. Its high-quality material makes it possible for you to wear it at any place, any time irrespective of season and places. Their vibrant colors, beautiful patterns, and unique designs leave an unforgettable impact on your personality. It’s all our endeavor and trust of our customer, which has made it possible for us to supply millions of exclusive pieces all over the world each year. We feel proud to say that people cherish our products. Their love for our products has compelled us to customize it as per their requirements. The mesmerizing hand block printing arts which are our customer’s delight across the border are Bagru and Sanganeri arts. These printing arts are very eye-catching and loved by all because generally these prints are characterized by the vibrant colors and beautiful textures. We at Aarav Collection have very creative team members who are expert in Bagru and Sanganeri printing art. Through their creativity, they weave spell in every traditional garment whether it is salwar suit, saree, bed sheet or any other home furnishing products. They are also expert in giving a trendy touch to these traditional garments. Basically, Bangru and Sanganeri are the names of two small towns situated near Jaipur in Rajasthan and are famous all over the world for hand block printing arts. Hence, like our other trusted customers who are the lover of Indian art in their cotton sarees, you also come and choose your design and pattern from our exclusive ranges. Our block printed cotton sarees are known for their lightweight, finest quality of cotton material, comfortable to wear and carry the elegance of vibrant color, design, and patterns which gives an everlasting impression on your personality.